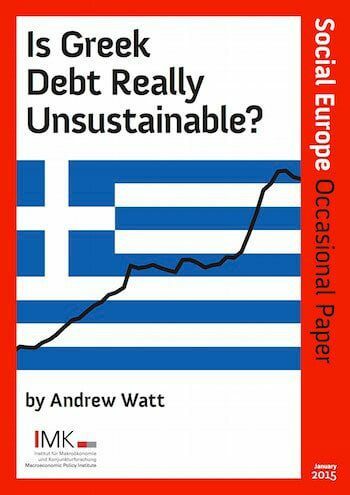 Home ・ Library ・ Occasional Papers ・ OP 6: Is Greek Debt Really Unsustainable? This Occasional Paper, authored by Andrew Watt, looks at the issue of Greek debt sustainability ahead of the elections on 25th January. Watt argues that it is far from clear that Greek debt is indeed unsustainable. According to Watt, fiscal and monetary policy changes would significantly help Greece to reduce its debt burden and make some sort of debt restructuring unnecessary. This paper is published in cooperation with our partners at the Macroeconomic Policy Institute (IMK)of the Hans Böckler Stiftung.